We have two cats, Chester and Isabelle. They are both tabbies and we love them as much as anyone can love a cat. They are our second set of matching cats as a family. 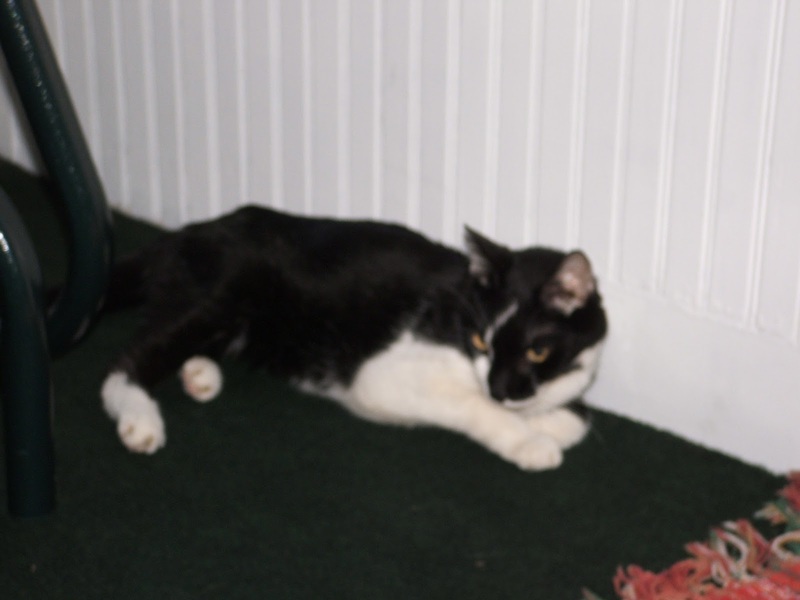 When we first got the house, we got Bogie, a black and white rescue cat from the Humane Society. Bogie was a little lover and a really great cat. He was alone though, so when my wife brought home a matching, smaller, black and white girl cat we suddenly had a matched set and were a two cat family. Cats bring a sense of life to an otherwise calm ordinary home. They come around when they want, and when they don't they retreat to hidden places. They're kind of introverted animals that way. It is a quality that makes them easier to love. Come to me when you need some attention, leave me alone when you don't. Jezebel, or Jez as we called her got very sick and we had to put her down due to renal failure. It was one of the hardest things we had to go through as a family. Death of anything is never easy, but we were all surprised at how attached we were to this little life. Not wanting Bogie to feel bad, we ended up getting Chester to fill the hole. Within a year of that, Bogie fell ill with some form of leg tumor and had to be put down as well. Again, a very difficult thing, especially for me, as I was always closer to Bogie than to Jez. It was one of the hardest things I've ever had to do. Again, not wanting Chester to be lonely, my wife and daughter were online at the Humane society's site not too long after Bogie died and before you knew it, we had adopted Isabelle and we had two matching tabbies. They are a couple just like Bogie and Jez. 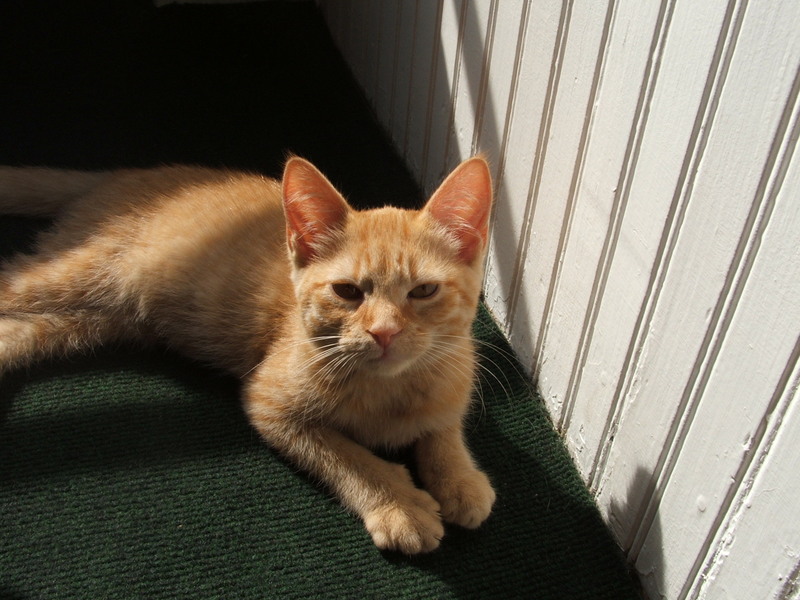 Littler female who favors the women of the house and older, bigger male that favors the males. Chester has taken up some weird habits. Unlike dogs, cats lead pretty uninteresting lives, but Chester, or Chet as we sometimes call him, likes to spice things up. 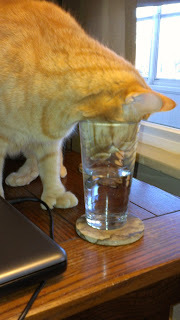 For example he has a thing for fresh water, preferably my fresh water. It's fairly annoying, but comical at the same time. Cats can be entertaining if they get bored enough. 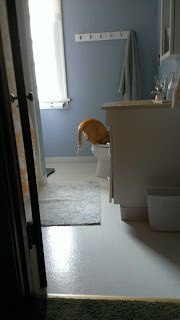 Another example of his zeal for fresh water, is his love of the freshly flushed toilet. Man, I tell you there's nothing like lapping it out of the bowl where someone has just done their business. What's with that? 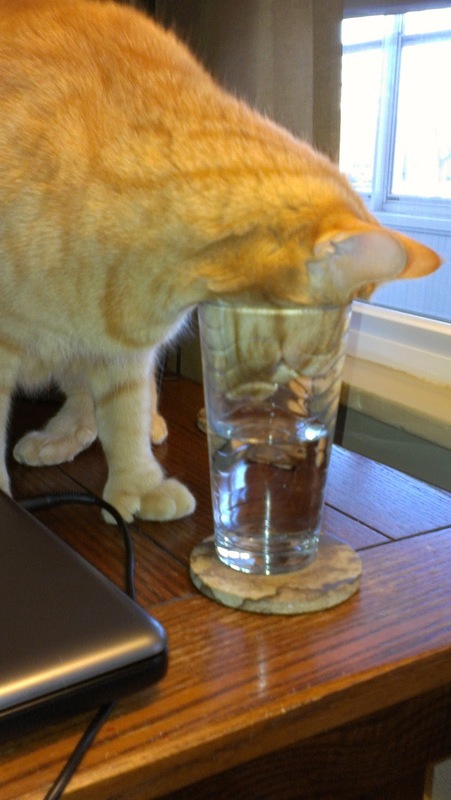 And people say cats are smarter than dogs, cleaner than dogs. Well, I ain't buying it. They're dirty little lovable creatures just like dogs. They tend not to want to lick your face after they've licked themselves like dogs, but dirty creatures nonetheless. Lovable dirty creatures. In the heat of summer our cats often seek out cooler spaces. 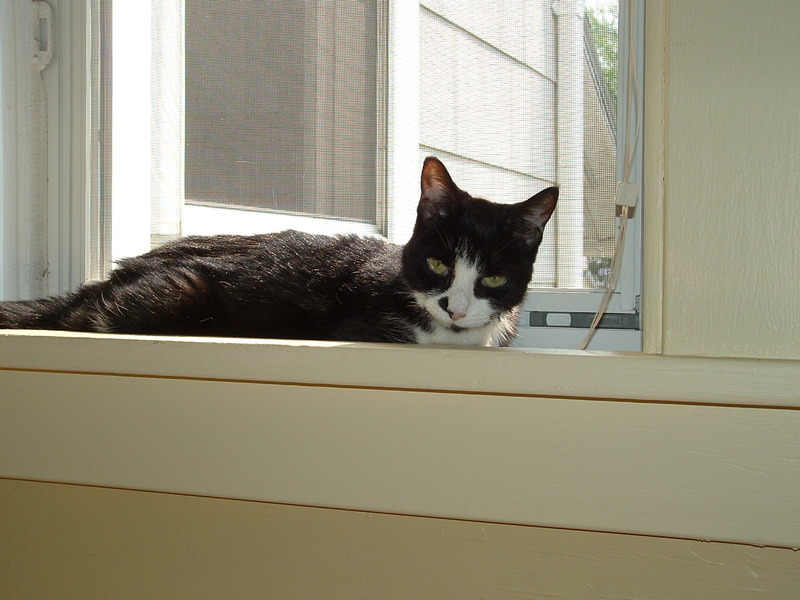 Isabelle prefers the basement window sill has her perch to watch the world and stay cool at the same time. Her brother Chester is not as keen on the basement. 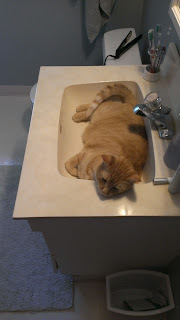 He prefers the bathroom. After all he's got a fresh water supply and a bed all in one spot. Until then if I could only get Chester to use the toilet as a toilet and wash himself in his bed, I'd be in business.